Hey Uttori readers, in case you haven’t noticed, I’ve been on hiatus lately, but that doesn’t mean that I’ve been idle. Our team is always trying to think of ways to engage and entertain Always Uttori readers. With that in mind, I’m excited to announce our new vlog series: Mission to Munch. Sometimes, as an introvert, you need the right motivation to get out of the house, for me that motivation is food. If you follow the blog closely you may have seen, or even tried, some of our Uttori recipes (if not what are you waiting for?). Our Mission to Munch vlogs are an extension of our blog. The goal of Mission to Munch is to take you on culinary adventures in various cities and to also share recipes you can make at home. Joining me on my adventures is my co-host and sibling, Christian, who often helps with video content on the blog. If you’ve been a long-time reader of the blog, you might remember that both my brother and I are INTJs, which means double the death stares. Just kidding. Or am I? INTJ stares notwithstanding, we invite you to join us on our culinary escapades as undertake the most important mission of all – a Mission to Munch! 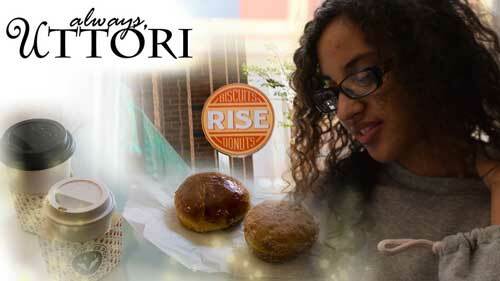 In the first episode of Mission to Munch, we try Rise Biscuits/Donuts in Savannah, GA. Check out our first vlog below and let us know what you think in the comments! We love to get feedback and also love hearing reader’s/viewers thoughts. And until next time, Bon Appetit!